Objective: To identify the bioactive extracts from Alternanthera sessilis and investigate its cytotoxicity potential against colon cancer cells, HT-29. Methods: This study examined the effects of three parts (aerial, leaf, stem) of whole plant on HT-29 colon cancer cell lines. Three different extracts from the plant parts were prepared by maceration technique using 80% ethanol. The anticancer activities were determined using MTT, clonogenic, cell motility and AOPI assay. The chemical composition profiling was analyzed by GC-MS. Results: Among three plant part extracts, leaf extract greatly suppressed the growth of colon cancer cells in time and dosage-dependent manner, followed by aerial and stem. The cytotoxicity results were rationalized with clonogenic, cell motility and AO/PI assay, where extract showed the most active activity compared to aerial and stem extracts. GC-MS analysis of leaf extract showed there were various recognized anti-cancer, anti-oxidant and anti-inflammatory compounds. Conclusions: Amid the screened extracts, the leaf extract exhibits the credible cytotoxic, anti-proliferative and apoptotic activity and hence, our findings call for additional research to conclude the active compounds and their mechanisms determining the apoptotic activity. Colorectal cancer (CRC), commonly acknowledged as colon or rectal cancer, is a growth (polyp), which forms on the inner wall arising from colonic epithelium. CRC is the second most wontedly diagnosed cancer in both men and women worldwide. LocalizedCRCs are diagnosed with sigmoidoscopy and colonoscopy. This is the major screening test for CRC and it screens only about one third of the colon. Polyps are usually benign, but may progress into malignant cancer over time. Invasive CRCs that are curbed within the wall of the colon (stages I and П ) are curable with surgery. Tumor removal with surgery is the major therapeutic strategy, with success rate of 15% to 25% at initial stage of CRC patients. If left untreated, they advance to lymph nodes regions and distant sites (stage Ш and IV), and are usually not curable, even with chemotherapy,. Despite the institution of vast group of effective chemotherapeutic drugs, chemotherapy is not devoid of its own intrinsic hitches. Chemotherapy drugs are unable to distinguish between the cancerous and healthy cell. Various kinds of life threatening toxicities are confounded with chemotherapeutic treatments such as giddiness, skin discoloration, hypoesthesia, audio-visual impairment, nausea, diarrhea, hair loss, decreased appetite, malnutrition, decreased libido, neutropenia, permanent organ damage, organ failure and internal hemorrhage. The poor diagnostic strategy and unsatisfactory therapy instigate higher mortality rate among CRC patients. This entails the investigation of other opportunities for the treatment of CRC,,. It is a perplexing task for researcher to formulate chemo-drug that kills the highest number of cancerous cells with maximum therapeutic index to the cancer patients with less adverse effect. There are countless dietary products that evince anti-cancer potential with minimum or no adverse effect in clinical trials for cancer therapy. So, researchers strive to establish new agents. Herbal therapies in particular, are believed to provide holisticmaintenance of health in regard to the development of CRC,. Natural chemical moieties are lead molecules, propounded to current therapies for CRC and there are four groups of plants based anticancer agents that have high successive rate in the market today, the vinca alkaloids, the epipodophyllotoxins, the taxanes and the camptothecin derivatives. Still, plants have vast potential to offer newer drugs as they contain wide array of unexplored chemical compounds and are reservoir of natural products derived compounds that might provide more protective potential towards cancer than synthetic drugs. However, little knowledge exists about the bioactive natural compounds accountable for this biological outcome and their cellular and molecular mechanism(s) of action against cancer. The genus Alternanthera (family Amaranthaceae), is widely cultivated in tropical and sub-tropical region and practiced in traditional medicine for ages. In India, Alternanthera sessilis (A. sessilis) is utilized broadly as a raw drug source in Siddha medicine. It is traditionally known as ‘Ponnangani’ in Tamil and joyweed in English. It is a small prostrate herb with several spreading branches bearing short petiolate, modest leaves and white flowers with prostrate stems, often rooting at the nodes, 10 cm to 100 cm long. Leaves are obovate, rarely linear-lanceolate, 1-15 cm long, 0.3-3 cm wide, and petioles are 1-5 mm long. Flowers in sessile spikes are 0.7-1.5 mm long and fruits are utricles 1.8-3 mm long and 1.3-2 mm wide. Seeds are lenticular, 0.9-1.5 mm long and 0.8-1 mm wide. Mostly, it is found throughout hotter parts, ascending an altitude of 1 200 m in the Himalayas and even cultivated as a pot-herb. In india, the traditional systems of medicine use A. sessilis as a galactagogue, cholagogue, febrifuge and “remedy” for snake venom. The plant is described to have β -sistosterol hydrocarbons, nonacosane, enecycloartanol, stigmasterol, cycloecucalenol, α -spinasterol, oleanolic acid rhamnoside, 24-methylene cycloartenol, lupeol, campesterol, 5- α -stigmasta-7-enol, 16-hentriacontane and handianol. Various types of phytocompounds isolated from the A. sessilis, reveal a wide spectrum of biological activities comprising antimicrobial activity, wound healing activity, antioxidant activity, hepatoprotective activity, hematinic activity, anti-ulcer activity, hypoglycemic activity, antidiabetic activity, antidiarrheal activity and anti-inflammatory activity, cytotoxic and antitumor ,,,,,,. Based on our understanding, the anticancer activity of A. sessilis extract on colorectal cancer is left unexplored. Hence, the current study involves the assessment of the anticancer activity of the A. sessilis aerial, leaf and stem extracts in human colon cancer cells (HT29). This work may aid in featuring the potential therapeutic approach of A. sessilis plant parts in colon cancer. The green whole sample of A. sessilis from Seminyeh farm in the month of July 2016 was collected and validated by Dr. Shamsul Khamis, a phytologistat the Institute of Bioscience, Universiti Putra Malaysia, Serdang, Selangor, Malaysia. A voucher specimen was placed in the IBS Herbarium unit (SK 2938/15). The plant material was washed assiduously to eliminate soil particles, then shade-dried for 8 d at room temperature. The aerial, stem and leaves were separated, and ground to fine powder using conventional grinder before storing in airtight bottles. Roughly 6 000 g of the powdered plant parts (aerial, leaves and stem) were extracted successively with ethanol maceration at a ratio of 1:10 (powder/solvent). The solvent was concentrated at 45 °C, using rotor evaporator to obtain the crude extracts, yielding 30.03 g (5%) of aerial, 20.04 g (3.4%) of leaf and 17.4 g (2.9%) of stem. The extracts (aerial, stem and leaves) obtained were stored -20 °C until further use. Human colon cancer, HT-29 cells and 3T3 cells were purchased from American Type Culture Collection. Cells were maintained in supplemented RPMI with 10% heat inactivated FBS and 1% antibiotics (100 units/mL penicillin-streptomycin), the pH 7.4 was maintained in a humidified atmosphere of 5% CO2 at 37 °C. Cell growths about 70%-80% confluence were used in the experiments to maximize the proliferation. For all in vitro assays, the stock solutions were prepared by dissolving the A. sessilis ethanolic extracts in dimethyl sulfoxide (DMSO). The working solutions were freshly diluted in the PBS solution, with final DMSO concentration of less than 0.1%. Positive control, paclitaxel was dissolved in 1% DMSO and further diluted in culture media to achieve desired concentration of 50 ng/mL. The viable HT29 cells were seeded in 6-well plates at a density of 1 × 106 (1 mL/well) and left to attach for next 24 h. Next, culture medium was gently aspirated and the cells were treated with A. sessilis plant parts (100, 150 and 200 μg/mL) and incubated for another 24 h in a humidified CO2 incubator. The medium containing extracts was discarded and replaced with fresh medium and incubated for another 5 d. Cells were fixed in 500 μL fixative (75% methanol and 25% acetic acid) for 5 min at room temperature. The fixative was aspirated and the cells were stained with 0.5% crystal violet for 30 min at room temperature. Cells were then washed under running tap water to remove the dye. Colonies were photographed with inverted microscope. HT 29 (1 × 106) cells were plated in 12-well plates for monolayer formation up to 80% confluence. The used media were removed from the wells and by using pipette tip a straight scratch was made, stimulating a wound. Fresh media about 1 mL of media were added to all wells except the first one (negative control). Different concentrations of A. sessilis plant parts (100, 150 and 200 μg/mL) were added and allowed to incubate for 24 h. The images were photographed at 0 and 24 h by inverted phase microscope. The cell migration was articulated as the percentage of the gap relative to the total area of the cell-free region instantly after the scratch using ImageJ software. Dual acridine orange/propidium iodide (AO/PI) is a fluorescent staining, studied under fluorescent microscope. HT 29 viable cells were seeded in 6-well plate and incubated at 37 °C in 5% CO2 atmosphere. Twenty-four hours later, the media were discarded and replaced with various concentration of A. sessilis plant parts (100, 150 and 200 μg/mL) dissolved in culture medium and incubated at 37 °C in 5% CO2 atmosphere for 24, 48 and 72 h. Then, 10 μL of cellular pellets were added into equal volume of staining solution (1:1) containing AO (10 μg/mL) and PI (10 μg/mL) and were observed under ultraviolet (UV)-fluorescence microscope within 30 min after staining. The viable cells (green nuclei with intact structures), apoptotic (bright-green nuclei with condensed chromatin), late apoptotic cells (orange nuclei with condensed chromatin) and necrotic cells (red nuclei with intact structures) were scrutinized for the morphological alterations under fluorescence microscope. Each experiment was conducted in three times (n=3) as a control in quantitative evaluation. GC-MS investigation of A. sessilis leaf extracts was achieved using QP-2010 Ultra GCMS spectrometer (Shimadzu, Kyoto, Japan) fused with a BPx5 column (30 μm × 0.25 μm inner diameter × 0.25 μm df). Extracts were dissolved in methanol and water (1:1 v/v). The oven temperature was programmed commencing from 50 C at 0 min and amplified up to 300 °C , and was maintained constant for 10 min. Mass spectra were engaged with ion source temperature and interface temperature of 20 °C and 250 °C accordingly. Carrier gas was attuned with the given settings: total flow-11.8 mL/min, column flow-0.8 mL/min, linear velocity-32.4 cm/s, purge flow-3.0 mL/ min, split ratio-10. The mass scan parameters included from a start time of 2.5 min, with end time 93.0 min. The acquisition (ACQ) parameters involved the following conditions: Scan event time-0.10 s, scan speed-10 000, mass range-40 m/z to 700 m/z. Values were expressed as mean ± standard deviation (SD). The analysis was accomplished using one-way ANOVA (ANOVA) in SPSS version 21.0 software (SPSS, USA). The data were achieved that were paralleled with control and treated groups by Student’s t-test. Values of P < 0.05 versus control group were regarded significant statistically. The cytotoxicity of A. sessilis plant parts on HT 29 and 3T3 cell lines was investigated through MTT assay. The test identifies the reduction of MTT by mitochondrial dehydrogenase to purple colored product, namely formazan. Cells were treated with A. sessilis plant parts at concentrations ranging from 25-500 μg/mL for 24, 48 and 72 h. The percentage of cell viability was analyzed. [Figure 1] depicts the cell viability values for the 24, 48, and 72 h. HT 29 cell line responded to the cytotoxic effects of the A. sessilis plant parts in a dose- and time-dependent fashion. The cytotoxicity of aerial and leaf extracts of A. sessilis (IC50 < 200 μg/mL) was better than stem extract (IC50 > 500 μg/mL) on HT 29 cell line. 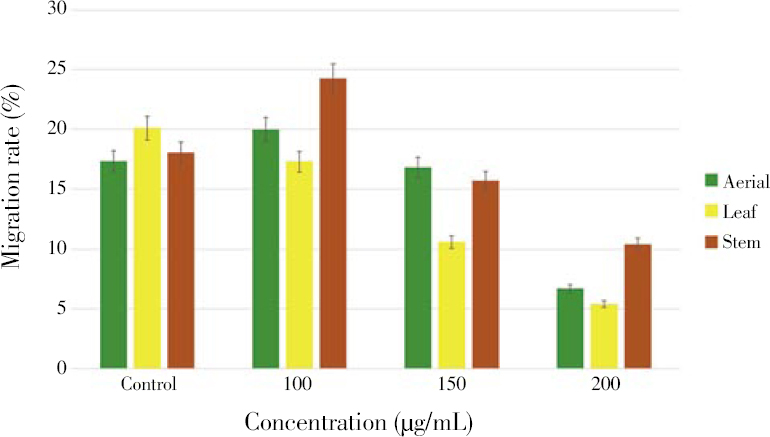 The extracts exhibited selective cytotoxicity when tested against normal fibroblast cell 3T3, indicating all extracts of A. sessilis plant parts were nontoxic to 3T3 with IC50 > 500 μg/mL. The assay reaffirms the sensitivity of the A. sessilis plant parts on HT 29 compared to the noncancerous cell [Figure 2]. Figure 1: Dose and time dependent cytotoxic effect of A. sessilis plant parts on HT 29 cells by MTT assay. 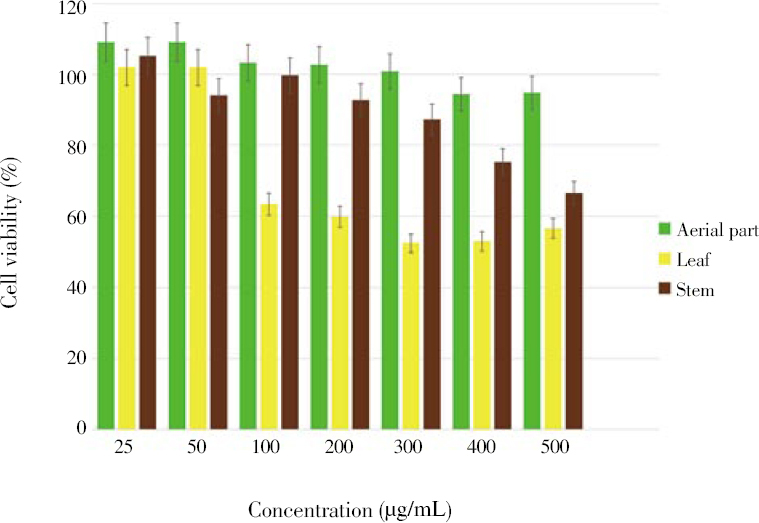 Cells were treated with different concentrations of A. sessilis aerial, leaf and stem extracts (25, 50, 100, 200, 300, 400 and 500 μg/mL) for 24 (A), 48 (B) and 72 (C) h. Data are denoted as mean percentage of viable cells in bars ± SD of at least three replicates in three independent tests. Figure 2: The cytotoxicity effect of A. sessilis plant parts on 3T3 cells. 3T3 cells were treated with A. sessilis aerial, leaf and stem at different concentrations from 25 μg/mL to 500 μg/mL for 72 h. Data are represented as mean percentage of viable cells in bars ± SD of at least three replicates in three independent tests. The anti-proliferative activity of the A. sessilis plant parts was validated further by clonogenic formation assay. This assay discloses the capability of cells to grow into colonies, unhindered via growth contact inhibition, unlike normal growing cells that terminate the cell proliferation upon contact inhibition. As presented in [Figure 3], a perceptible decrease in colony formation in HT 29 cell was observed when treated with various concentrations of A. sessilis aerial, leaf and stem. Remarkably, all extract of A. sessilis exhibited significant effect in dose dependent manner and the most potent anti-proliferative activity was witnessed in leaf extract of A. sessilis, about 80%-90% reduction in colony formation at 200 μg/mL. The decrease in HT 29 cells colony formation by subsequent to the leaf extract of A. sessilis treatment and positive control, paclitaxel was found to be significant. Since the reduction of the colony formation in HT 29 cells was over a period of 5 days, this suggested the long-term anti-proliferative effect of A. sessilis plant parts. Figure 3: Colony formation inhibition of HT-29 cells on treatment with A. sessilis plant parts for 5 days. Experiment was performed in three individual wells of 6 wells plate and was compared with the control, n=3. To examine the effect of A. sessilis plant parts on cell motility, scratch assay on confluent monolayers of HT 29 cells was carried out. After 24 hours of incubation with various concentrations of A. sessilis plant parts, it was observed that in comparison to untreated control cells, extracts of A. sessilis plant parts successfully repressed the migration of cells in a dose dependent fashion [Figure 4]. The quantitative analysis of the matching bar graph displays the formed migration [Figure 5]. The control cells filled-up the wound gap almost 20% after 24 h, whereas the percentage of wound closure rate treated with extracts of A. sessilis plant parts at 100, 150 and 200 μg/mL concentrations decreased with concentrations. A noticeable decrease was found in leaf comparable to aerial and stem extracts. The results indicated that A. sessilis leaf extract could significantly contribute to the reduction of metastases. Figure 4: Inhibitory effects of A. sessilis plant aerial (A), leaf (B) and stem (C) parts on the of HT-29 cells. The various concentrations (100 μg/mL, 150 μg/κg and 200 μg/mL) treated on HT 29 cell line was observed for migration rate by scratch assay. The HT 29 cells were scratched with p200 pipette tips and 0 h was the initial view of scratch, prior to any treatment. After 24 h, the distances of cell migration were photographed and measured. Experiment was performed in three individual wells of 6 wells plate and was compared with the control, n=3. Figure 5: Effect of A. sessilis plant parts (aerial, leaf, stem) on cell migration rate. The migration rate was monitored at 0 and 24 h. After treatment, the cell migration was analyzed using J-image software and defined as the percentage of the initial gap between the two edges of each wound. The data were expressed as mean ± SD (n=3). 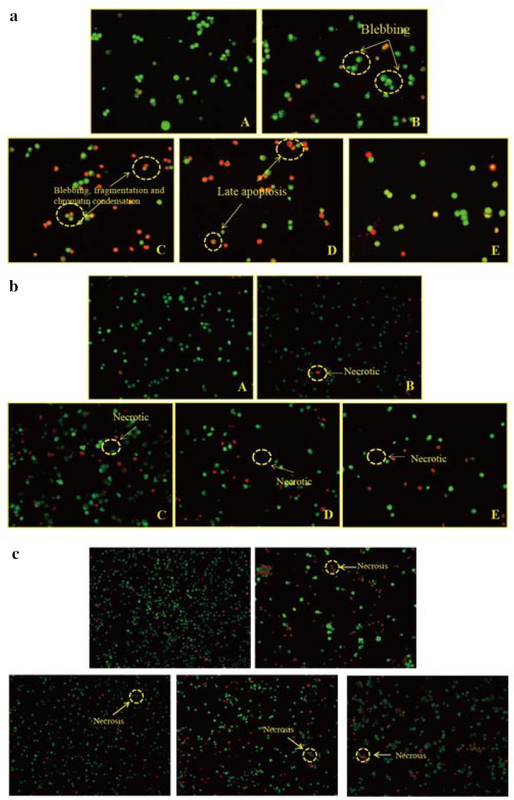 To determine whether the growth inhibition of HT 29 cells is associated with cell death, AO/PI double staining of HT-29 cells by fluorescence microscopic analysis was performed. Based on morphological description, the untreated HT 29 cells showed high number of viable cell and reduced number of apoptotic cells detected after 72 hours of incubation for all A. sessilis plant parts. Apoptotic cells in untreated group may be due to natural cell death. This may be attributed to increased cell density, decreased nutrient solution cultivation, increased metabolism, cell depletion resulted from the impact of nutrition and metabolic products, in which they cease proliferation. For the treated cells, the dissemination of normal cell was lower compared to apoptotic cells, in dosage dependent manner for all A. sessilis plant parts. Particularly, at 72 h, A. sessilis leaf extract treated cells exhibited separation of apoptotic body and appearance of orange-reddish color were due to AO attachment to damaged DNA [Figure 6]a. Whereas, A. sessilis aerial and stem extracts [Figure 6]b and [Figure 6]c showed high number of necrotic cells, even in low concentration accompanied by reduction in cell viability. Based on the results, only leaf extract of A. sessilis promoted apoptotic features in HT 29 cells which retained the cell viability, morphologic criteria of apoptosis and reduced number of necrotic features. Figure 6: HT-29 cells with different features of apoptosis and secondary necrosis as detected by dual staining with AO and PI after 72 hours of treatment with A. sessilis leaf extract (a), aerial (b) and stem (c). A: Untreated control; B: Paclitaxel (50 ng/mL) C: Low concentration (100 μg/mL); D: (150 μg/mL); E: High concentration (200 μg/mL) (magnification: × 400). a: Apoptotic cells showed membrane blebbing, DNA fragmentation and chromatin condensation. Necrotic cells showed diffused chromatin with apparent nucleus membrane disruption at highest concentration; b: Necrotic cells showed diffused chromatin with apparent nucleus membrane disruption; c: Necrotic cells showed diffused chromatin with apparent nucleus membrane disruption. Next, to identify the active components of A. sessilis leaf extract, GC-MS was performed. Chromatogram with the peaks of the compounds tested with respect to retention time is shown in [Figure 7]. The best matched hit with the target was selected for compound identification. The pharmacological effects with their retention time (RT), peak area (%) and nature of compounds are presented in Table 1. The GC-MS result showed 13 phytoconstituents in the leaf extract from which some are higher hydrocarbon alkanes, ester, terpenes, flavonoids, organic compounds, steroids, and fatty acids. 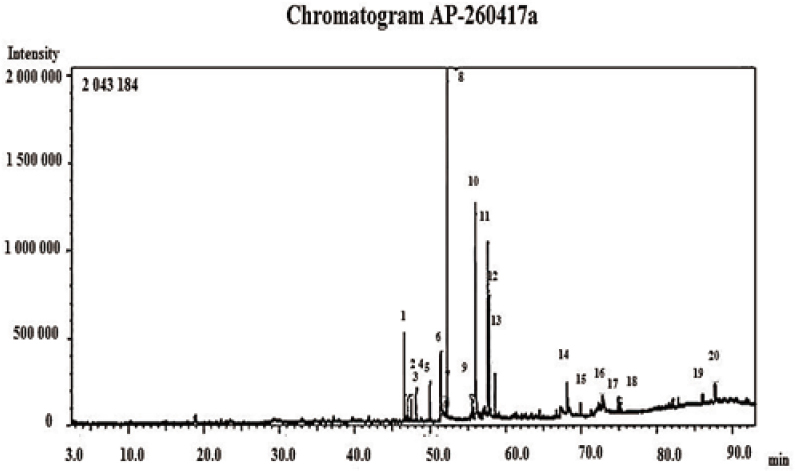 Figure 7: GC-MS chromatogram of A. sessilis leaf extract. The peaks display bioactive anticancer composites were interpreted. Cancer’s imperative features are alteration in the mechanisms that control the cell proliferation and differentiation. Unlike normal cell behavior, cells with neoplastic transformation endure repeated cycles of proliferation and metastasize to distant organs due to expression of cell surface antigens. This type of tumor cells is known as malignant tumor which can invade normal tissues surrounding the body through blood or lymphatic vessels. Malignant tumor is hardly encapsulated and has abnormal morphology where their tissue origin may not be recognizable. However, the migration of cancerous cells to other site to develop secondary cancer is dependent on the interaction of metastatic cells with different organ environments like rate of blood flow (angiogenesis), vascular anatomy and number of cells delivered to secondary organ. Since neoplastic cells are biologically heterogenous which contain diverse population of tumor cells, this feature orchestrates the invasion, via extracellular matrix, intravasation, endurance in a blood or lymphatic vessel, extravasation into a distant site, to cause illness and eventually, death of the patient. Chemotherapeutic drugs are a novel treatment modality with the aim of reversing or halting carcinogenesis. In case of disseminated cancers (lymphoma, for example), chemotherapy is the sole therapeutical approach to surgical procedure and radiotherapy. Ideal anticancer agents would lead to absolute remissions of cancer cells without affecting normal cells. Regrettably, there is not any agent available to meet this standard, as current chemotherapy agents are not able to distinguish between eradiating the cancer and normal cells. Rather, these drugs weigh benefits against toxicity in a search for a favorable therapeutic index. The common adverse effect from chemotherapy procedure includes gastrointestinal problems (nausea, vomiting, and diarrhea), bone marrow suppression, infertility, anemia, and alopecia. Despite dramatic improvements in patient survival and drug tolerability, several drugs may present life threatening toxicities such as organ damage and hematological toxicity. Now, chemotherapy is more common as palliative therapy rather than therapeutical therapy that functions to provide temporary relief of the symptoms and signs of cancer and complete enhancement of life quality. Cancer growth eradication in absence of adverse effects is acknowledged as a vital goal for the development cancer therapy. Owed to the current preoccupation with synthetic chemistry’s safety and efficacy, the dependence on the natural products is becoming colossal. Natural products being synonymous with “secondary metabolite” are identified from herbal plants, with substantial part in the prevention and therapy of cancer management. A vast range of structurally novel chemo types with potent and selective biological activity can serve as chemical models or templates to design, synthesis, and semi synthesis of novel substances for the treatment of various human disorders. Out of 155 anticancer drugs approved in western medicine, 47% were classified as natural products. Plants, animals, marine organisms and microorganisms hold tremendous amount of secondary metabolites as potential anti-cancer agents. Thus, a significant number of plant-sourced agents and the mechanism of interaction between many phytochemicals and cancer cells have been extensively focused for the treatment of cancer. At present, this investigation focuses upon the efficacy of A. sessilis extracts from aerial, leaf, and stem as an anti-cancer agent on CRC. Though countless pure compounds from plants are being discovered for their anticancer properties, it is becoming increasingly acknowledged that the healthful effects of plants are due to a combination of complex interplay from bioactive compounds present in the plant (additive/ synergistic and/or antagonistic) rather than constituent of pure or single agents alone. Characterization of the phyto-compounds as well as investigation of the specific cytotoxic pathway may help to determine whether these extracts are valuable for anticancer effects. This plant in the genus Alternanthera showed varieties of biological activities. The extract of A. sessilis is currently reported to have lethal effect on cancer cell lines. Though, the inhibitory effects and the anticancer mechanism of this plant have not been reported. With this mind-set, a detailed and comprehensive study on the in vitro cytotoxicity, clonogenic survival, cell motility and apoptotic activity of A. sessilis aerial, leaf and stem extracts was carried out to assess the phenotypic changes on HT-29 cell line. Cytotoxicity is demarcated as the ability of chemical compound to kill a cell autonomous from the cell death mechanism. Cytotoxicity assay is the most suitable method for identifying new compounds with selective cytotoxic nature on cancer cells within a short time. The cytotoxic potency of the A. sessilis plant parts was confirmed by the in-vitro MTT method. The MTT assay is founded on the postulation that non-viable cells can’t reduce tetrazolium. However, it hinges on the type of cell, cellular metabolism, and incubation time with the MTT. The cytotoxicity of the A. sessilis plant parts was found to be dose dependent on HT 29 cancer cells and did not possess lethality characteristic to the healthy 3T3 cell with an IC50 more than 200 μg/mL, endorsing the safety of the extracts. The anticancer activity of the potential extract to distinguish between normal and cancer cells is an important paradigm in the design and discovery of chemotherapeutic agents. Among the three extracts studied, high potency was seen towards A. sessilis leaf extract. The results are comparable to that of work done by Chung et al. , where the plant extracts from Saudi Arabia possessed greater toxicity to human breast adenocarcinoma (MCF-7) cancer cell lines but did not confer any lethal effect on normal cell line. The toxic effect of an anticancer agent is defined by its damage in- vitro conditions to the proliferative integrity of individual cells. The reproductive and proliferative inability is identified by incidence of cell death. On the contrary, a cell that is reproductive and proliferative can form a larger colony of cells or is known as “clonogenic”. Under suitable experimental conditions and functional dosage of anticancer agents, the cells are impaired cells to divide and form colonies,. The HT 29 proliferation declined in a dose-dependent fashion with increasing concentrations of A. sessilis plant parts. The most effective extract among A. sessilis aerial, leaf and stem was the leaf extract followed by aerial and stem extract. The effect of these leaf extracts is almost similar to positive control as far as cell killing is concerned. It can be stated monitoring of colony formation revealed that A. sessilis plant parts were toxic at relatively low concentrations in HT 29 cell line. Further, these results are confirmed by cell motility studies. It was observed that A. sessilis plant parts produced anti- clonogenic property on the HT 29 cell line in a dosage-dependent manner similar to that of a previous study conducted by Hanahan et al. , which reported the in vitro anti-clonogenic potentials of the medicinal plants from Mizoram on MCF-7 (human breast cancer) and HeLa (human cervical cancer). It is widely acknowledged that metastasis is number one cause of mortality in cancer and one of the most complex biological processes in human diseases. Metastasis is a complex process which involves invasive growth through the extracellular matrix, cell spreading through blood or lymph vessels to distant organs. It is of huge interest in therapeutical management to recognize the invasive features of cancer cells, which are altered in cancer cells to drive the first step of metastatic dissemination. Thus, to scrutinize the effect of A. sessilis plant parts on migration of HT 29 cells, scratch assay was performed on untreated control and A. sessilis plant parts treated cells. Interestingly, A. sessilis plant parts, especially leaf extract, reduced the movement of cancer cells in a significant manner, indicating its potentiality for future use as an anti-cancer drug in colon cancer therapy. Based on these results, it can be accepted that the inhibitory effects of the leaf extracts on HT 29 cell migration may due to their cytotoxic effects. A few studies have shown that in-vitro migration assay has been as a tool to measure the effect of plant extract on arresting cancer cell motility, indicating a crucial linkage between the cytotoxic compounds and metastasis. Most of the studies reported that in cancer; the cell death is critically executed by apoptosis. Chemotherapeutic agents can control apoptotic cell death that is helpful in the management and therapy of cancer. The preliminary apoptotic effect can be studied using morphological assessment by AO/PI staining method. AO is a membrane-permeable cationic dye that fixes to nucleic acids of life cells and deflects a green fluorescence. PI is not permeable to intact membranes but penetrates the membranes of nonviable cells, causing orange fluorescence. Therefore, AO/PI staining can be feasibly utilized to analyze apoptotic-associated changes of cell membranes during the process of cell death. In this study, A. sessilis plant parts cause cell growth inhibition and activate apoptosis differentially in HT 29 cells. This observation suggests that only A. sessilis leaf extract had distinctive morphological changes that incriminate apoptotic markers such as membrane blebbing, fragmentation of DNA, and formation of apoptotic body. These features are evinced under fluorescence microscopy by the bright-green and orange color from the AO dye stained. Whereas, A. sessilis aerial and stem extract demonstrated more necrotic cells even at low concentration of the treatment, which may be probably owing to the toxic nature of A. sessilis aerial and stem extract resulting in the damage of plasma membrane of HT 29, thus causing the PI dye to enter and make the cells appear red (necrosis). Therefore, additional studies on their physiological and biological mechanism might aid in the development of anticancer compounds in A. sessilis leaf extract for the colorectal cancer chemoprevention. In order to unveil the spectrum of compounds present in the A. sessilis leaf extract, GC-MS analysis was carried out which facilitates the comprehension of plant toxicity on its anticancer activity against colon cancer. Most of the compounds identified in the A. sessilis leaf extract possess medicinal properties such as anticancer, anti-inflammatory and antioxidant. An integral connotation between inflammation, antioxidant and cancer has long been suspected. Now there is mounting substantiation that chronic inflammation and reactive oxygen species (ROS) may lead to different kinds of malignancies including stomach, colon, breast, skin, prostate, and pancreas. Nuclear factor kappa-light-chain-enhancer of activated B cells (NF-κB) signaling inhibition has potential therapeutic application in inflammatory related cancer diseases. Hexadecanoic acid, carbonic acid, octadecadienoic acid and linoleic acids possess a strong pro-inflammatory response which outline its novel application in various cancer therapies. Besides, numerous studies have also reported ROS are closely related totumorgenesis. Neophytadiene, phytol, heptadecanone and octadecyne were authenticated to avert angiogenesis by elevating enzymatic antioxidant and inhibiting ROS production and oxidative stress. This biological activity of compounds present in A. sessilis leaf extract provides integral support to the medicinal application of the plant against colon cancer,. The result above concludes there has been a mounting attention in the natural products as alternative medicine for their therapeutic properties in the recent years. Based on the study using in vitro methods, it can be affirmed that A. sessilis plant parts possess anticancer activities. Ethanolic leaf extracts of A. sessilis is utmost active for the treatment of colon cancer. Moreover, pharmacological profiling using other cancerous cell line is needed to affirm whether this extract can be sourced as new anticancer medicine in the future. Hence, it is also recommended to determine the active constituents and the mechanisms of action of how A. sessilis leaf extract inhibits the development of colon cancer. The authors assert no competing interest concerning the publication of this article. Al-Asmari AK, Albalawi SM, Athar MT, Khan AQ, Al-Shahrani H, Islam M. Moringaoleifera as an anti-cancer agent against breast and colorectal cancer cell lines. PLoS One 2015; 10(8): e0135814. Mar-kowitz SD, Bertagnolli MM. Molecular basis of colorectal cancer. N Engl J Med 2009; 361: 2449-2460. Akhil G, Anuj M, Jha KK, Ashok K. Nature’s treasurer: Plants acting on colon cancer. J Stress Physiol Biochem 2011; 7(4): 217-231. Desai AG, Qazi GN, Ganju RK, El-Tamer M, Singh J, Saxena AK, et al. Medicinal plants and cancer chemoprevention. Curr Drug Metab 2008; 9(7): 581-591. Hawk ET, Levin B. Colorectal cancer prevention. J Clin Oncol 2005; 23(2): 378-388. Jung KH, Noh JH, Kim JK, Eun JW, Bae HJ, Chang YG. Histone deacetylase 6 functions as a tumor suppressor by activating c-Jun NH2- terminal kinase-mediated beclin 1-dependent autophagic cell death in liver cancer. Hepatol 2012; 56(2): 644-657. Aggarwal B, Prasad S, Sung B, Krishnan S, Guha S. Prevention and treatment of colorectal cancer by natural agents from Mother Nature. Curr Colorectal Cancer Rep 2013; 9(1): 37-56. Lee HJ, Lee EO, Rhee YH, Ahn KS, Li GX, Jiang C, et al. An oriental herbal cocktail, ka-mi-kae-kyuk-tang, exerts anti-cancer activities by targeting angiogenesis, apoptosis and metastasis. Carcinogenesis 2006; 27(12): 2455-2463. Safarzadeh E, Sandoghchian S, Shotorbani S, Baradaran B. Herbal medicine as inducers of apoptosis in cancer treatment. Adv Pharm Bull 2014; 4(Suppl 1): 421-427. Gupta HC, Raj J, Rathi A, Sundaram EN, Kumar S, Manchanda RK. Morpho-anatomy of leaf, stem and root of Alternanthera sessilis (L.) R. Br. Ex D and Alternanthera pungens Kunth (Amaranthaceae) and its significance in drug identification. Indian J Res Homeopathy 2012; 6(4): 1-7. Chadha YR. The wealth of India, a dictionary of indian raw materials and industrial products. Science 2003; 114(2950): 49. Jerajoni HR, Dhurat RS, Kolhapure SA. Evaluation of efficacy and safety of clarina cream in newly diagnosed and previously treated cases of acne vulgaris. Indian J Clin Pract 2004; 14: 27-34. Chandrika UG, Svanberg U, Jansz ER. In vitro accessibility of β -carotene from cooked Srilankan green leafy vegetables and their estimated contribution to vitamin A requirement. J Sci Food Agric 2006; 86(1): 54-61. Gayathri BM, Balasuriya K, Panduka de S, Gunawardena RV. Toxicological studies of the water extract of green leafy vegetable Sessile joy weed (Alternanthera sessilis). Curr Sci 2006; 91(11): 1517-1520. Lin SC, Lin YH, Shyuu SJ, Lin CC. Hepatoprotective effects of Taiwan folk medicine: Alternanthera sessilis on liver damage induced by various hepatotoxins. Phytother Res 2006; 8: 391-398. Sunil J, Nitin A, Patil M, Chimkode R. Antimicrobial and wound healing activities of leaves of Alternanthera sessilis Linn. Int J Green Pharm 2008; 2(3): 141. Johnson M, Wesely EG, Selvan N, Kavitha MS. In vivo and in vitro Antibacterial efficacy of Alternanthera sessilis (Linn.). Int J Pharm Res Dev 2010; 133:843-849. Yadav SK, Das S. Evaluation ofanti-diarrhoeal property of crude aqueous extract of Alternanthera sessilis Linn. Int J Pharm Innov 2013; 3: 389-395. Tan WS, Arulselvan P, Karthivashan G, Sharida F. Moringa oleifera flower extract suppresses the activation of inflammatory mediators in lipopolysaccharide-stimulated RAW 264.7 macrophages via NF-κB Pathway. Mediators Inflamm 2015; 2015: 720171. Doi:10.1155/2015/720171. Gothai S, Arulselvan P, Tan WS, Fakurazi S. Wound healing properties of ethyl acetate fraction of Moringa oleifera in normal human dermal fibroblasts. J Intercult Ethnopharmacol 2016; 5(1): 1-6. Muniandy K, Gothai S, Tan WS, Kumar SS, Mohd Esa N, Chandramohan G, et al. In vitro wound healing potential of stem extract of Alternanthera sessilis. Evid Based Complement Alternat Med 2018; 2018: 3142073. Doi:10.1155/2018/3142073. Safarzadeh E, Sandoghchian SS, Baradaran B. Herbal medicine as inducers of apoptosis in cancer treatment. Adv Pharm Bull 2014; 4(suppl1): 421-427. Tracey AM, Lin Y, Andrew JS, Jane L, Wen GJ. Cancer invasion and metastasis: Molecular and cellular perspective. Landes Biosci 2013; 2: 135-168. MacDonald V. Chemotherapy: Managing side effects and safe handling. Can Vet J 2009; 50(6): 665-668. Liu B, Ezeogu L, Zellmer L, Yu B, Xu N, Joshua-Liao D. Protecting the normal in order to better kill the cancer. Cancer Med 2015; 4(9): 1394-1403. Gerl R, Vaux DL. Apoptosis in the development and treatment of cancer. Carcinogenesis 2005; 26(2): 263-270. Azmi AS. Adopting network pharmacology for cancer drug discovery. Curr Drug Discov Technol 2013; 10(2): 95-105. Radha R, Kavimani S, Ravichandran V. Antitumour activity of methanolic extract of Plumeria alba L. leaves against Dalton lymphoma ascities in mice. Int J Health Sci Res 2008; 1(2): 79-85. Veeresham C. Natural products derived from plants as a source of drugs. J Adv Pharm Technol Res 2012; 3(4): 200-201. Walter TM, Merish S, Tamizhamuthu M. Review of Alternanthera sessilis with reference to traditional siddha medicine. Int J Pharmacogn Phytochem Res 2014; 6: 249-254. Elisha S, Michal L, Sarah S, Helena P, Elaine S, Haya LG. Evaluating medicinal plants for anticancer activity. Sci World J 2014; 82: 12. Das MA, Devi G. In vitro cytotoxicity and glucose uptake activity of fruits of Terminalia bellirica in Vero, L-6 and 3T3 cell lines. J Appl Pharm Sci 2015; 5(12): 092-095. Aung TN, Qu Z, Daniel Kortschak R, Adelson DL. Adelson understanding the effectiveness of naturalcompound mixtures in cancer through their molecular mode of action. Int J Mol Sci 2017; 18(3): 656. Ali MA, Farah AM, Al-Hemaid FM, Abou-Tarboush FM. In vitro cytotoxicity screening of wild plant extracts from Saudi Arabia on human breast adenocarcinoma cells. Genet Mol Res 2014; 13(2): 3981-3990. Chung DM, Kim JH, Kim JK. Evaluation of MTT and Trypan Blue assays for radiation-induced cell viability test in HepG2 cells. Int J Radiat Res 2015; 6(6): 713-724. Rah BA, Haris M. Inhibition of wound closure and decreased colony formation by Clerodendrum infortunatum L. in lung cancer cell line. Int J Curr Res Biosci Plant Biol 2015; 2: 66-73. Rosangkima G, Jagetia GC. In-vitro anticancer screening of medicinal plants of Mizoram state, India, against Dalton’s Lymphoma, MCF-7 and Hela cells. Int J Recent Sci Res 2015; 6(8): 5648-5653. Hanahan D, Weinberg RA. Hallmarks of cancer: The next generation. Cell 2014; 144(5): 646-674. Zhou H, Huang S. mTOR signaling in cancer cell motility and tumor metastasis. Crit Rev Eukaryot Gene Expr 2010; 20(1): 1-16. Aziz MYA, Omar AR, Subramani T, Yeap SK, Ho WY, Ismail NH, et al. Damnacanthal is a potent inducer of apoptosis with anticancer activity by stimulating p53 and p21 genes in MCF-7 breast cancer cells. Oncol Lett 2014; 7(5): 1479-1484. Formigli L, Papucci L, Tani A, Schiavone N, Tempestini A, Orlandini G, et al. Aponecrosis: Morphological and biochemical exploration of a syncretic process of cell death sharing apoptosis and necrosis. J Cell Physiol 2000; 182(1): 41-49. Mascotti K, McCulluogh J, Burger SR. HPC viability measurement: Tryphan blue versus acrdine orange and propidium iodide. Transfusion 2000; 40(6): 693-696. Newman DJ, Cragg GM. Natural products as sources of new drugs over the last 25 years. J Nat Prod 2007; 70(3): 461-477. Abdel SI, Abdul AB, Alzubairi AS, Mohamed EM, Mohan S. In vitro ultramorphological assessment of apoptosis induced by zerumbone on (HeLa). J Biomed Biotechnol 2009; 2009: 769568. Doi:10.1155/2009/769568. Bhattacharyya A, Chattopadhyay R, Mitra S, Crowe SE. Oxidative stress: An essential factor in the pathogenesis of gastrointestinal mucosal diseases. Physiol Rev 2014; 94(2): 329-354. Franken NA, Rodermond HM, Stap J, Haveman J, Van BC. Clonogenic assay of cells in vitro. Nat Protoc 2006; 1(5): 2315-2319.